Story: I have seen fennel seeds being used in Indian pickle spices, in "panch poran" for tadka, and may be in pakodas and such.. But I have not seen raw fennel being used in Indian cooking. Have you? I am really curious why someone would choose to use only the seeds and ignore the flavorful root and green fronds of Fennel... may be because fennel seeds were imported from somewhere?? 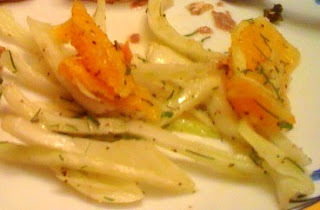 Anyway.. Fennel adds a unique crispness to the taste & texture of this salad. The flavor is a bit strong, but goes really well with oranges. In fact I was a bit unsure about starting my meal with the fennel flavor.. usually I fennel seeds are eaten after a typical Indian meal. But orange and fennel turned out to be a great combo.. I think this salad would be best suited for summer. Eat it with your favorite sandwich or with grilled fish. Add all the ingredients in a salad bowl with salt and pepper to taste. Mix well and enjoy! Interesting - I don't think I've ever made anything using fennel root. Just not something I'd pick up while grocery shopping. But this salad sounds like I should try it soon.